Mid90s is the directorial debut of Jonah Hill (also writing) and is a coming of age story centering around Stevie (Sunny Suljic), a lonely adolescent in a mid-nineties Los Angeles. Even after a startling opening scene of brotherly squabbles, it’s clear he idolizes his “cool” older brother (Lucas Hedges) and longs for being just as “cool” as him. Seeking friends, Stevie ventures off to a local skate shop where he begins to test the boundaries of his comfort zone. Within this skate shop, he meets a group of skaters that will soon become the driving force in what shapes his adolescence. He bonds quickly with Ruben (Gio Galicia) who’s probably around the same age as Stevie but comes off a lot less jovial. In addition to Ruben is three older skaters, “Fourth Grade” (Ryder McLaughlin), Ray (Na-kel Smith), and “F.S.” (abbreviated for courtesy – assume the worst) played by Olan Prenatt. With his newfound friendships and passion for skating (or maybe just fitting in), we follow Stevie through multiple days of skating throughout the summer months of LA. He becomes kind of a mascot to the crew after showcasing some serious bravery in attempting a skateboarding stunt. It probably also helps that his stature is much smaller than the rest of the crew (sans Ruben) and his genuine innocence and delightful smiles shine in contrast to the rest of them. We learn through Ray that every one of the skaters, including him, have gone through some very tough times and skating is an escape for them and growing up in a single parent home with an abusive brother certainly meets the criteria. 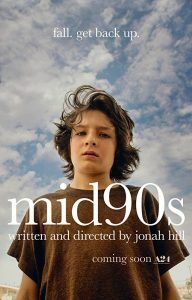 Performance wise, everybody is on point with Sunny Suljic leading the way with his charming smile and innocence. We see his demeanor and personality shift throughout the film as he smokes and drinks for the first time, meets a girl, and even breaks a few bones. A powerful scene between him and his mother (Katherine Waterston) is certainly memorable as one of the best scenes in the film as he demonstrates some new found adolescent rage from pent-up aggression. Lucas Hedges continues to impress and add to his already remarkable film record. Although his screen time in Mid90s in minimal, it’s vitally important as the older brother figure and he shines in every scene he appears in. Rather than tell a story with a beginning and an end, Hill mostly just captures what feels like days in Stevie’s life. What makes it feel even more genuine is that he and cinematographer Christopher Blauvelt capture the entire film in a squared off 4:3 aspect ratio, a format you’d have found in many homes and skate videos from that era. While some may say it’s too “artsy,” I think it was that creative decision that turns Mid90s from something good to something great. Combined with another beautiful score by Trent Reznor & Atticus Ross (The Social Network, Gone Girl), I think Jonah Hill delivered one hell of a nostalgic blow to the filmgoers of at least our generation.